Yep, I’m still in the Czech Republic. It truly is an amazing country, but it can be difficult to communicate with people who speak a different language. I speak Dutch, English, some German and some French, but Czech? Not so much. Today, I thought I would give you some different techniques on how to communicate with someone that speaks a different language. Things are about to get intense. Technique number one: Scream and yell. When someone doesn’t understand what you’re saying try raising your voice. If this doesn’t work keep turning the volume up! Scream, yell, maybe shout a little. It will work. I promise. Technique number two: The pointer. When you need something just keep pointing at the thing you want. Just keep that finger up in the air. You can also use the aggressive point! Really put your body into it. Don’t give up. Technique number three: Sign language. I know the Italians are pros at this, but that doesn’t mean you can’t use this technique as well. Use your arms, your legs, twist your hips, do a handstand, try an interpretive dance. Just do whatever it takes to explain yourself. Technique number four: Emotional breakdown. Everybody understands emotions. Sadness, anger, fright, happiness. Trust me when all else fails your emotions will get the message across. 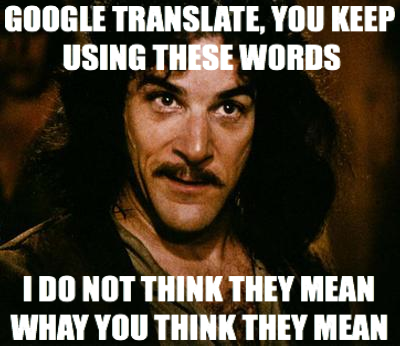 Technique number five: Google that sh*t. When nothing worked and you really don’t know what to do just use Google Translate. Type in whatever you want to say and click the Mic icon thingie. Some scary voice will pronounce whatever you want to say, perfectly.